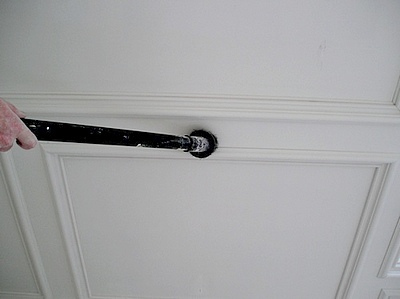 Vacuum off walls and woodwork of any dust or cob webs. Most wall surfaces that appear to be in good condition don’t need very much in the way of cleaning. The following technique will make the job relatively quick and easy. First, vacuum the wall with a shop-vac. This will pick up loose dust and cobwebs. You can go without vacuuming and use a duster brush for the occasional cobweb if the walls are in good non-dusty condition. Pay special attention to the trim, dust likes to collect where the base meets the wall. Then mix up a bucket of cleaning solution comprised of one to two cups white vinegar and a half-tablespoon of a good grease-cutting dish soap like Dawn®. Use at least two gallons of water. You want it to be as easy to rinse away the soap suds as it is to rinse dishes after you wash them in soapy water. Now, collect some lint-free rags. Old t-shirts are a good choice. Get the rag good and wet. Wring it out and start wiping the wall down. As the rag gets dirty, rinse it out in the cleaning solution. Continue around the room until you have cleaned all the walls. Get fresh water and a new rag. Go around the room a second time, using plain water. This will ensure that no residue is left behind. 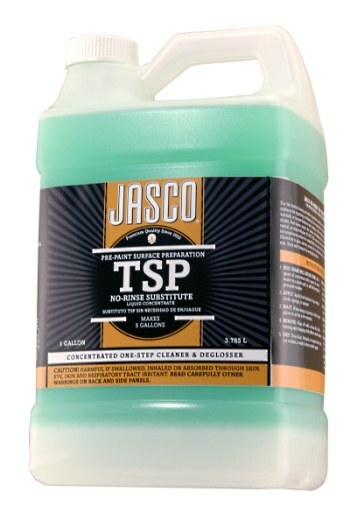 For tough cleaning use No-Rince TSP. You will need gloves as it is harsher than normal mild cleaners. The nice part is final rinsing clear water isn’t necessary.